The $100 million residential apartment tower Opera in South Brisbane is set to accelerate its construction program after achieving more than $85 million in sales since its launch late last year. Developed by Melbourne-based family business Kaias, the 16 level-Opera tower will be built in Cordelia Street by Hutchinson Builders in association with local development managers Marquette Properties. Opera is among a number of local projects being delivered jointly by Hutchinson and Marquette in Brisbane, including a major refurbishment of a commercial building at 215 Adelaide St, the redevelopment of Post Office Square and the delivery of more than 1,000 student accommodation beds in the city. 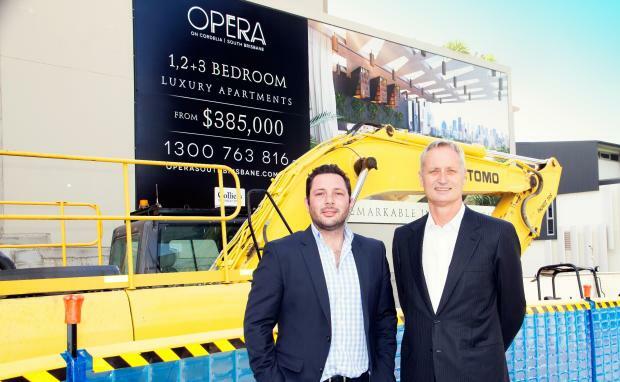 Marquette Properties director Adam Di Marco (publisher of Urban Developer) said local buyers had rushed to Opera to take advantage of the project’s owner-occupier design focus and location in South Brisbane overlooking the CBD. “There is a very strong element of Brisbane buyers which demonstrates that locals recognise Opera’s enviable location in South Brisbane’s vibrant cultural, dining and leisure precinct and on the doorstep of the CBD,” said Mr Di Marco. “Opera is finding traction with CBD workers and young professionals as well as investors taking advantage of South Brisbane’s status as a high rental yield area. Hutchinson Builders chairman Scott Hutchinson said a 21-month construction timeline would have Opera on track for completion by March 2017. “We are pleased to be working on a high calibre project such as Opera and look forward to creating what will be an iconic project for South Brisbane,” he said. Opera will comprise 180 one, two and three-bedroom apartments atop a street-level entrance and ground-floor retail and office precinct. Residents on the upper levels of Opera will enjoy unobstructed views of the city, Musgrave Park and west to Mt Coot-tha. Opera residents’ onsite leisure facilities include a roof-top pool and entertainment area overlooking the Brisbane skyline. Marquette Properties has played an integral role in the delivery of the project having secured Development Approval, launched the sales and marketing campaign and appointed Hutchinson Builders. Opera is the first Brisbane development for the Kaias family, which assembled a strong Brisbane design team to create classic, timeless urban residences that meet the needs of the local market. Brisbane architects Paul Fairweather and Anthony Jemmott have worked in concert with Trish Szonert, of MMO Interiors, to design the building. Photo: Marquette Properties director Adam Di Marco (left) and Hutchinson Builders chairman Scott Hutchinson.